How do you choose the best moving company in Phoenix, Arizona? Moving a business can be an arduous task. There are too many things to consider, for instance, the costs, the trust, and the speed with which you need to get moving. It is critical to make note of all the things you need and then choosing the perfect company to make your move. Moreover, you need to count in the aspects of whether you want to pack your belongings yourself, or you have items that might need more professional handling. 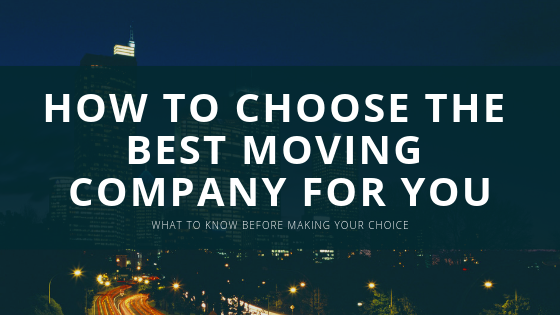 Here are a few tips that will help you choose the right moving company to help you relocate your office. Make sure you have a note of all these points so that you don’t skip anything important. 1. Time the move: Timing is the first thing you should look into. If you have a few weeks before you want to move, you can spend quality time deciding on how to choose the best moving company. If you have fewer days left, you might want to compromise on certain aspects and go ahead with what seems right at the moment. Do I need the moving company to also provide me with junk removal or can I manage it on my own? Do I have fragile items that will need professional packing or is it possible for me to handle it? If you find a company that fits well with your requirements, you can go with that moving company. 3. Distance: it is very importance to consider the distance between your current location and destination. A lot of moving companies can be very efficient with close by moving, but they might be unexperienced when it comes to long distance moving. Look for a company that is good at managing packing and moving timely for the distance you need to move to. 4. Ask for referrals: The internet can be a pretty confusing place to look for the best moving company. You might want to trust this packer and mover, and believe in someone else’s experience rather than risking your precious items in the hands of a strange, unpopular moving company. Ask you friends and family members who have recently moved to suggest a good moving company for you. 5. Adding Trust: Even though you’ve selected a few moving companies based on known and trusted referrals, research the company’s track record on Better Business Bureau. You can do this online free of charge and it gives you an extra level of added trust. Not forgetting to check the company’s licensing and accreditations. 6. Budget: once you have shortlisted companies based on their trustworthiness and your requirements, you should bring in the aspect of costing. Try and negotiate with these packers and movers and get a quote from them. Finally, choose the right moving company that fits perfectly into your budget. There is no hierarchy to these steps, but all the points are noteworthy and important in choosing the best moving company for your moving needs. So make sure you don’t miss out on any of these aspects. We at Cor Movers wish you a happy and safe moving! Get a quote from Cor Movers.